Takayasu arteritis (TA) is an idiopathic, chronic granulomatous vasculitis. It is probably due to autoimmune cell-mediated immunological reaction. It causes segmental stenosis, occlusion, thrombosis and/or aneurysm formation in aorta and its branches. A high degree of suspicion is necessary in making its diagnosis. A case is presented in which the diagnosis was curiously missed at multiple levels. A large-vessel vasculitis in an adult is a chronic inflammation of aorta and its major branches. It includes giant cell arteritis and TA. TA is an idiopathic, chronic granulomatous vasculitis which is associated with an inflammation that begins from the adventitia and progresses to the intima, leading to vascular segmental stenosis, occlusion, and/or formation of aneurysm. Its diagnosis can be difficult, unless a high degree of suspicion is exercised. A case of TA in a young parous woman is presented in which the diagnosis was curiously missed at multiple levels. A 26 year old woman, gravida 3 para 2 abortion 1, was transferred to our center from another center in emergency. She was transferred for critical care in view of being pulseless and with no recordable blood pressure after an abortion. She had two cesarean sections in the past, the second one being 7 months before this abortion. The abortion was actually a medical termination of pregnancy by self prescribed and self administered mifepristone-misoprostol combination after 2 months of amenorrhea. She had mild bleeding for 4 days, soaking 2 pads per day, followed by passage of products of conception vaginally. When she presented to a hospital near her home, she was found to have no palpable radial pulse and no recordable blood pressure in the right upper limb. A diagnosis of hemorrhagic shock was made. She was transfused two bottles of Ringer's lactate 500 ml each, and two bottles of plasma expander (Hetastarch or hydroxyl starch, 500 ml each) rapidly. When the pulse and blood pressure did not come up, she was started on a noradrenaline drip at a rate of 0.4 mg/hour. When that did not achieve any improvement in her pulse and blood pressure, she was put in a cardiac ambulance and rushed to our center for critical care, an intensivist accompanying her. When she was seen in our emergency medical services, her general condition was fair. She was conscious, well oriented, and speaking coherently. Her heart rate was 76/min and respiratory rate was 16/min. Her radial pulse was not palpable and BP was not recordable in the right upper limb. There was no cyanosis or pallor. The noradrenaline drip was continued and an urgent obstetric call was made. The obstetric resident and junior consultant confirmed the findings of the emergency room resident. Obstetric examination showed that the abdomen was soft and supple, there was minimal vaginal bleeding, the uterus was of 6 weeks' size and the products of conception were felt through open cervix. An obstetric diagnosis of an incomplete abortion was made. The state of no palpable pulse and no recordable blood pressure in the presence of normal heart and respiratory rate and an otherwise good condition of the patient could not be explained. The urinary bladder was catheterized and 600 ml of clear urine was drained. Then the head of the obstetric services was contacted on phone for advice. After hearing about the findings and the response to medical treatment, he made a provisional diagnosis of an incomplete abortion in case of chronic vasculitis, probably TA. An evacuation of the retained products of conception and evaluation of the occlusive vasculitis in due course was advised. The emergency medical unit continued administration of the noradrenaline drip. A CT angiography was obtained, which showed occlusion of the distal right subclavian artery, right carotid artery and left subclavian artery. The arch or aorta, renal arteries and uterine arteries were normal. A diagnosis of type I TA was made. The noradrenaline drip was then discontinued by the emergency medical service unit. The patient was transferred to the obstetric unit. Investigations for fitness for anesthesia showed normal results. A blunt curettage was done under local anesthesia to remove the retained products of conception. The patient made an uneventful recovery after the procedure. Careful questioning of the patient the next morning by the head of the obstetric unit revealed that she had been diagnosed to have some vascular condition at the time of her previous cesarean section 7 months ago at another hospital, but she did not undergo any investigations as advised, and she also hid this history when she presented for management of her abortion. She did not give any explanation for her actions. Counseling was done about her illness, illegality of self-induced medical abortion, the risks of medical abortion in view of two previous cesarean sections and lack of exclusion of an extrauterine pregnancy prior to administration of the drugs, the need for disclosing all past medical history to her treating doctor and akways following medical advice. She was subsequently transferred to the medical unit for further management of TA. Figure 1. CT angiography showing occlusion of the distal right subclavian artery (yellow arrow), right carotid artery (green arrow) and left subclavian artery (red arrow). TA has an incidence of 1.2-2.6/million per year in the western world and even greater incidence in Southeast Asia, Africa, and central and South America. It is generally seen in young adults with a predilection for women. It is an autoimmune condition, influenced by both genetic and environmental factors. It is believed to have an association with Mycobacterium tuberculosis. A patient with TA may be asymptomatic with incidental finding of unequal pulses or may present with features of vascular occlusion such as cerebrovascular accidents or renal failure. The diagnosis is not very difficult if the lower limb pulses are checked when the upper limb pulses are not palpable, and blood pressure is measured in the lower limbs when it is not recordable in the upper limbs. The carotid pulses may or may not be palpable in TA. Conventional angiography is the time tested traditional method for the diagnosis of TA. In modern times multidetector CT angiography (CTA) is preferred for this purpose as it is less invasive, early and accurate in depicting luminal as well as mural lesions of the aorta and its branches. It shows concentric mural thickening, calcification in the thickened wall, a double ring enhancement pattern on the post-enhanced CTA images (the inside ring being poorly enhanced and the outside ring being obviously enhanced). [6-11] Luminal stenosis is seen in about 90% of patients. The differential diagnoses includes atherosclerosis, polyarteritis nodosa and giant cell arteritis. [6,13] It does not include a hemorrhagic shock. It was unfortunate that this diagnosis was made in the case presented. The error stemmed from a failure to observe the basic examination algorithm when peripheral pulses are not palpable. It ignored the fact that a woman in hemorrhagic shock cannot have normal pulse and respiratory rates, and will not converse normally and do other things that healthy people do. There was a failure to realize that mild vaginal bleeding does not produce shock. The cause of such deviation is probably a sharp focus on one's own specialty and a refusal to apply knowledge of other subjects like obstetrics gained during medical graduation. Transferring the patient in a cardiac ambulance with an intensivist showed that the treating doctor was working in a well equipped hospital. But the noradrenaline infusion was unwarranted. It was fortunate that this patient did not develop any adverse effects to it. The patient's failure to get herself treated before planning another pregnancy and also to disclose her past medical history to her doctor was contributory to inadequacies in her treatment. TA is a condition that is uncommon and sometimes difficult to diagnose. But strict adherence to clinical examination protocols and application of at least basic knowledge of other specialties, combined with use of imaging by CTA helps clinch the diagnosis. It cannot be concluded that noradrenaline does not help in the management of TA by the study of this case, but it has never been used for this indication in the past. Anyway the pathophysiology of TA and pharmacological actions of noradrenaline do not suggest that noradrenaline would be a useful drug in managing TA. It cannot be concluded with the study of a single case that the use of noradrenaline does not harm a patient of TA, but I hope that further cases of this nature are not reported to help draw that conclusion. Luqmani R. Large vessel vasculitides: Update for the cardiologist. Curr Opin Cardiol. 2012;27:578–84. Epidemiology of large-vessel vasculidities. Richards BL, March L, Gabriel SE. Best Pract Res Clin Rheumatol. 2010 Dec; 24(6):871-83. Kothari SS. Aetiopathogenesis of Takayasu's arteritis and BCG vaccination: The missing link. Med Hypotheses. 1995;45:227–30. Brunner J, Feldman BM, Tyrrell PN, Kuemmerle-Deschner JB, Zimmerhackl LB, Gassner I, et al. Takayasu arteritis in children and adolescents. Rheumatology 2010;49:1806–14. Zhu FP, Luo S, Wang ZJ, Jin ZY, Zhang LJ, Lu GM. Takayasu arteritis: imaging spectrum at multidetector CT angiography. The British Journal of Radiology. 2012;85(1020):e1282-e1292. doi:10.1259/bjr/25536451. Khandelwal N, Kalra N, Garg MK, Kang M, Lal A, Jain S, et al. Multidetector CT angiography in Takayasu arteritis. Eur J Radiol 2011;77:369–74. Gotway MB, Araoz PA, Macedo TA, Stanson AW, Higgins CB, Ring EJ, et al. Imaging findings in Takayasu's arteritis. AJR Am J Roentgenol 2005;184:1945–50. 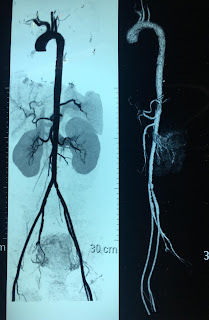 Matsunaga N, Hayashi K, Sakamoto I, Ogawa Y, Matsumoto T. Takayasu arteritis: protean radiologic manifestations and diagnosis. Radiographics 1997;17:579–94. Park JH, Chung JW, Im JG, Kim SK, Park YB, Han MC. Takayasu arteritis: evaluation of mural changes in the aorta and pulmonary artery with CT angiography. Radiology 1995;196:89–93. Kissin EY, Merkel PA. Diagnostic imaging in Takayasu arteritis. Curr Opin Rheumatol 2004;16:31–7. Mason JC. Takayasu arteritis—advances in diagnosis and management. Nat Rev Rheumatol 2010;6:406–15. Weyand CM, Goronzy JJ. Medium- and large-vessel vasculitis. N Engl J Med 2003;349:160–9.